1. Remove any dirt or stones in the millet. Wash it atleast 3 to 4 times and soak them in the water for atleast 4 to 5 hrs. 2. Same way Wash Idli rice, urad dhal and Methi seeds. Soak them for atleast 2 hrs. Everything has to be soaked separately. 3. Usually I grind them in the Wet grinder like how we grind Idli batter, but you can also use any Blender. 4. First grind Urad dhal with methi seeds to smooth batter. (Add water in regular intervals) Once Urad dhal is ground to smooth batter remove it to the container. 6. The batter should not be very smooth like Idli batter and very coarse like Adai batter. It has to be fine coarse texture. Now add the Millet batter to Urad dhal batter. Add salt and mix well (the consistency has to be like Idli batter). 7. During hot weather it’s enough to ferment the batter to 5- 6 hrs, but during cold weather it has to be fermented overnight. I usually ferment overnight. 8. Once fermented, Batter is ready for making Dosas. 9. When making Dosa add water to desired consistency. Take ladle full of batter and pour in the middle of hot skillet then go towards the edges of the skillet. 10. Add 1/2 tsp of oil, when it gets slightly brown at the bottom & edges flip over the other side, always keep it in the medium to low flame. 11. Add 1/2 tsp of oil and make it crispy or soft as desired. Mix the above mixture in a bowl. Once Dosa is made take couple of tsp of Carrot mixture, scatter the mixture over the dosa and roll it. 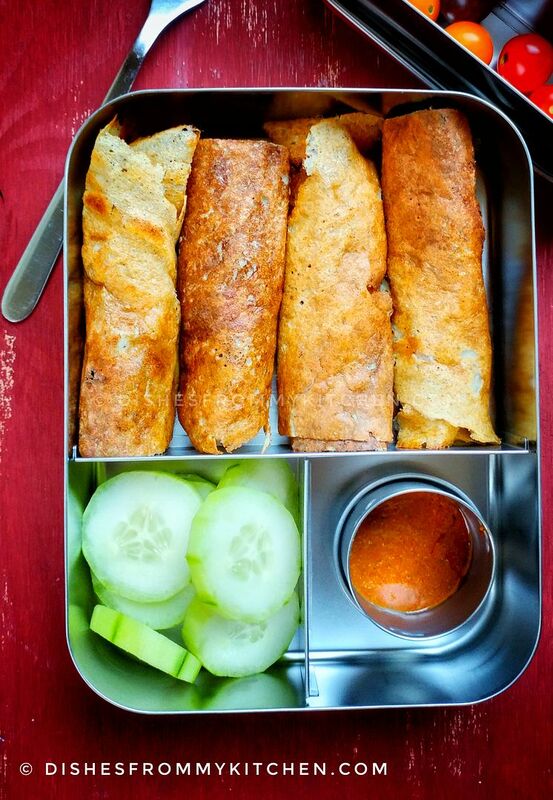 Cut the Dosa in the middle and pack it for Lunch box. 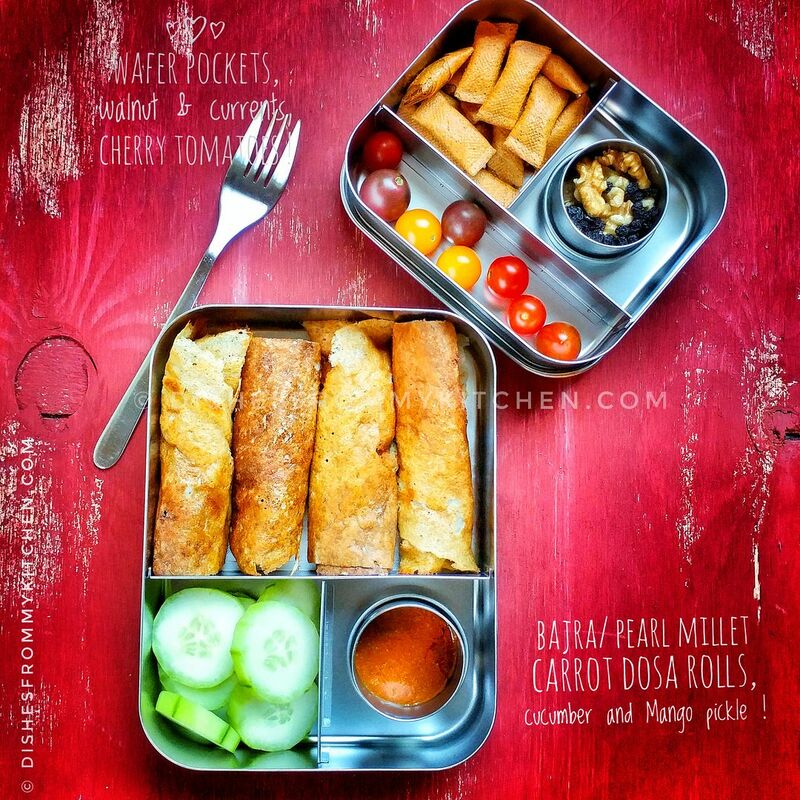 Don't make it too crisp or too thin if you are packing for lunch box, it will be difficult to roll and it dries up during the lunch time. I like it very much. I hope it will be one of my favorites and can't wait more to try it!!! Sometimes there are hundreds of recipes to waste time. Come back again when you have something useful and fresh to share. I would like to spend my free time in cooking with my family. Asian mills always look so good! And no matter, is it Indian or or Japanese. I love when everything is it's own place, separated. I hate when my wife puts me meet with potatoes and salad. Everything mixes and looks awful. 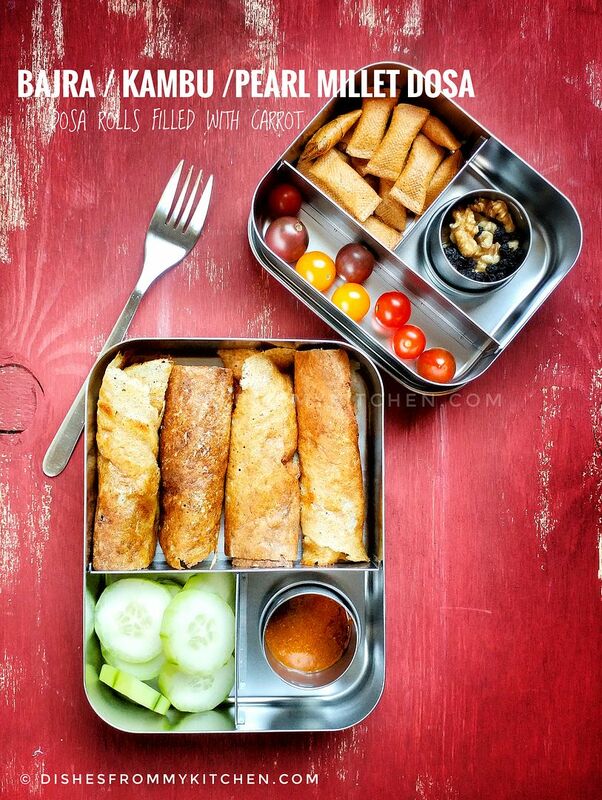 I saw a lot of different types of meals at the http://isthisthefuture.co.uk/discussion-board/ and now I want to ask her make me such lunches.